Here we invite you to follow the latest on the project implementation. The material is sorted, newest at the top of the page. 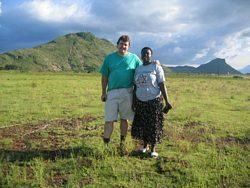 Cor & Grace are standing on the newly bought 25 acre land. In the background you can see the Osia Mountain. We now have the challenge to start building our schools.